The Marvel Collectibles Captain Marvel Statue by Bowen Designs is available for pre-order at Sideshow Collectibles. Captain Marvel made his first appearance in the comic book Marvel Super-Heroes #12 (1967). Mar-vell was a military officer from the planet Kree. Dispatched to Earth to spy on their burgeoning space travel technology, Mar-vell turns against his homeworld and champions the Earth in the face of otherworldly threats. 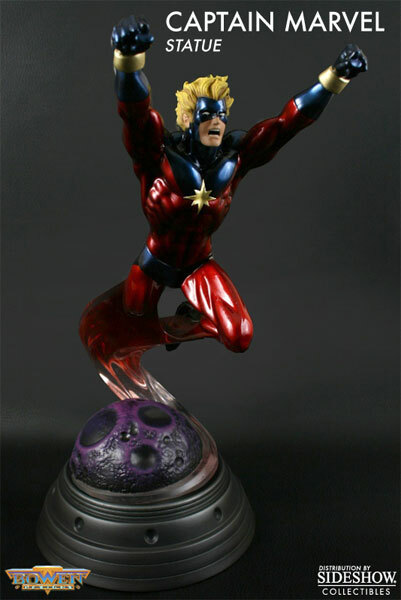 Captain Marvel eventually becomes a cosmic defender, battling dangers that threaten the entire galaxy. However, Captain Marvel’s adventures are cut short in Jim Starlin’s classic graphic novel, The Death of Captain Marvel (1982), which is one of Marvel’s greatest stories ever told. This amazing statue by Bowen Designs recreates the classic Captain Marvel, and stands 14″ tall, digitally sculpted by Joseph Menna. Follow the stars over to Sideshow Collectibles to pre-order the Marvel Collectibles Captain Marvel Statue by Bowen Designs!